Stopped at 22 hours with 78.75 miles. This race almost didn't happen for me. I ran into George Nelson (the race director) at the Seashore 50K in December and he said the 24 Hour Run was already seeing sign ups. By February I thought I should really fill out the form and found out the race was already sold out! Considering I signed up about 2 weeks before the race last year this came as a big shock to me. I got on the wait list and, well, waited. There wasn't much movement in March but by early April I had bounced to the #1 slot on the wait list and was officially "in" a few days later. I was determined to go further than the 75 miles from last year. My running was going pretty well. I had no injuries. I'd been doing a fair bit of backpacking with some big miles, long days, and decent elevation change. I felt bold enough to plot out lap times for 100 miles: 53 minutes per 3.75 mile lap (including any and all stops on the way). That's about 14 min/miles or about 4.25 miles per hour. Easy, right? I printed out a log sheet with the lap numbers, target clock times, and a blank for my actuals to be filled in on race day. It was an organizational masterpiece! It was also nice when visitors stopped by. They could add comments (real life example: "More than one tree with poison ivy - vk"), and see when I last around and guess when I might be back by my previous lap times. As this was my second go at a 24 hour run I made an effort to correct all the mistakes I made the first year. Last year my feet were in fairly severe pain from swelling in shoes that no longer fit them. I was well prepared with a variety of shoes in a variety of sizes this year and I'm pleased to say it worked. I also made the decision to run solo: no pacers, no crew. I wanted to see how I could handle things. I brought a cooler and plastic box of stuff (extra clothes, socks, shoes, foot care supplies, food, drink, etc) and found an empty place by a tree with poison ivy. I made a mental note not to lean on that tree. With a red headed lady on either side of my little spot I figured it would be pretty easy to locate. A whole little tent city pops up on the course near the start/finish/turn-around Saturday morning and slowly fades away through the night as folks depart. With no rain in the forecast I didn't bring any shelter. I left any chairs at home to avoid the temptation of sitting in one and subsequent torment of having to extricate myself from one. The race started at 7:15am. Two hundred or so folks start down the wide, flat path. It's a challenge to keep your pace in check with all the excitement. I was aiming for slow, steady, maintainable pace. Keep it easy as long as possible. It gets hard enough on its own without forcing it. There are all sorts of strategies, theories, and tactics in any run but the longer the race the more opportunities you have to foul it up. I knew I'd slow down when it got dark. It's not that running in the dark is inherently slow, it's just that I'd have already been on my feet for 12+ hours. I wanted to bank some time for the inevitable slow down. There's also the danger of going out too fast and becoming so tired/sore that you slow down too much. There's a balance that has to be made. I'm terrible at balancing. My first lap was 38 minutes (15 minutes in the bank already!). Too fast! The next five laps I settled down to about 42-43 minutes per lap. I was feeling pretty good with no issues. The air was still cool and I felt strong. I carried a bottle of water with me and was consuming about half a bottle a lap. Nekot cookies were hitting the spot and I always had a pack in my pocket. The park rangers (who also run in the race with their own team "Secret Squirrel Society") had done some serious work on the course. Two particularly rooty and muddy sections now had bridges and the trail that last year was a mud pit looked like it was re-graded a bit and covered in thick mulch to keep any mud at bay. These were big and well appreciated improvements. I had my phone set up to post Tweets every couple laps to enable family and friends to better guess when I'd be near the turn around. At 12:20pm the heat was starting to build and water wasn't cutting it anymore. I hadn't thought to bring something like Gatorade so I mentioned it in a tweet but it came out like this: "Six laps. if you stop by bring red haunp". Apparently "gatorade" isn't one of the auto-complete words in my phone. I tried typing it by hand in a hurry and got this tweet: "Gatoraddde". My first marathon split of the day was 5:05 hours. I hit 30 miles at 1:10 pm; basically 6 hours into the race. That's not bad. After another lap I decided to change shoes. Up to now I'd been wearing my favorite shoes, Asics Speedstars (now discontinued. Thanks Asics! ), but my feet were starting to feel the gravel and roots. I swapped to a pair of Asics DS Trainers. They have a thicker sole and I immediately felt some relief. I'm not sure exactly when I saw my friend Vince and his wife Dee on the course. It was in the lap 7-8 range. They live nearby and had stopped by to say hi and deliver some red Gatorade! This whole Twitter/remote crew thing was brilliant! I pondered what to tweet for next. The Gatorade really hit the spot and I alternated laps with water and Gatorade. At the peak heat times I was going through a bottle of water a lap, drinking when I was thirsty. I was still sweating some, didn't have dry skin or chapped lips, and didn't have any dizziness or tingling so I felt quite on top of things. I was grabbing a handful of the saltiest potato chips I could buy out of my cooler every lap or so also. Amusingly my brother saw the same tweet as Vince ("Six laps if you stop by bring red haunp") and interpreted as "bring red meat". Last year I had asked him to pick up some McDonalds dollar menu hamburgers on his way to pace me. He assumed the same and arrived in the early afternoon with a pair of hamburgers. I hadn't even known I wanted them but they were fantastic. I really can't stand gels and chews and snacking on crackers and chips gets old. Real food is fantastic. I stashed one burger in my cooler for later and carried the other one to eat on the go. I had set an alarm on my watch to beep every 53 minutes. The idea being that if I was running even splits on track for 100 miles it would beep every time I hit the turn around. Since I was running faster, it beeped earlier and earlier. Having a big "beep buffer" was encouraging. I knew at some point the trend would reverse. When it re-aligned I knew I was "on track". After that, well, worry about that when it happens. At some point I was a "lap ahead" in beeps. That didn't last long. Laps 10-12 slowed to just under an hour. There was pizza at the turn after lap 12. It was excellent. After lap 13 there were donuts. That was also excellent. Dunkin Donuts are going on my list of food-to-bring next year. My left inner knee starting bugging me in this time frame. I've experienced this before and it would come and go so I didn't worry too much about it. My mom stopped by in the afternoon to say hi. 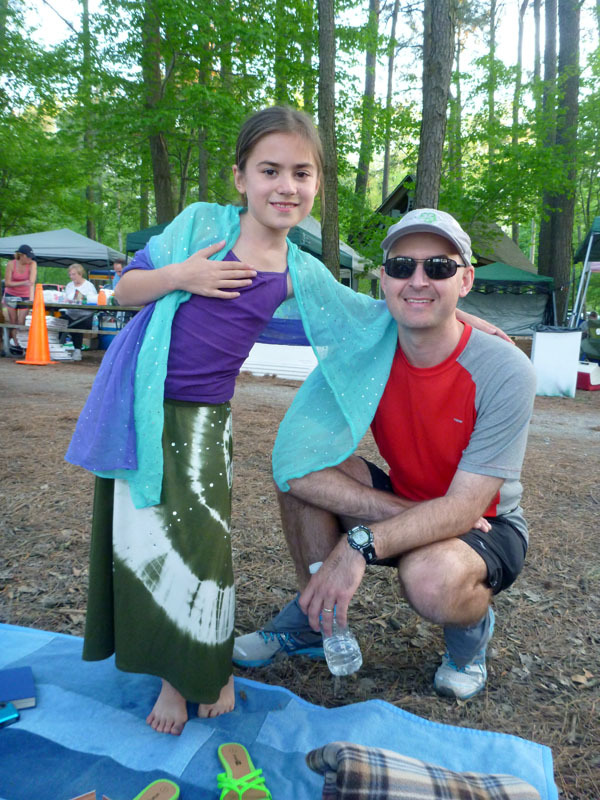 BJ and Kaylee stopped by and set up camp right by the turn around for a few laps to see the sights and cheer me on. It was great to see them. Laps 13-15 were in the 60-65 minute range per lap. My beep buffer was gone, as was the concept of 53 minute laps. I was reduced to walking. By lap 16 I had some blisters forming. My feet had been a bit tender for a while and I'd checked them a few times and reapplied Body Glide and Sportshield (topical anti-friction stuff). I had actual blisters now in a place I've never had blisters before. They were a matching set on both feet sort of between the big toe and second toe on the pad of my foot. I had some minor rubbing on the outside of my lower heel that I frequently get but it wasn't an issue. I changed out socks too just in case. It helped but doesn't make blisters magically go away. I start adding clothing layers around 11pm. The air was cooling off and I was slowing down and getting chilled. Laps 17-19 were dark and slow. I was tired and my feet were uncomfortable. My left inner knee was aching again. After 19 laps I stopped and re-assessed my feet and changed shoes again to a pair of Altra Torins. These are new to me and I hadn't worn them for more than maybe 10 miles. You just don't try new things on race day! Even if they caused problems I had 19 laps in the bank I only needed one more lap to hit 75 miles. That would at least match last year (and get me the 75 mile plaque!). Altra's have a very wide toe-box I find them one of the few shoes that don't crush my little toe. I like them. Lap 20 went slowly; nearly 90 minutes. I received congratulations for 75 miles by the ever cheerful and encouraging lap counters (those folks were awesome!). It was 3:30am and I told them I thought I had one more lap in me. I bundled up with another layer to stop the chill. I was tired and low on energy. If I had been more mentally with it I'd have eaten something. Lap 21 felt even slower but was just under 90 minutes. I was feeling very fatigued and tired to the point of staggering. It was now almost 5am. With 2 hours to go I could probably get in another lap but I was done. I called it a night, collected my plaque, gathered up my gear and headed to the car. On the way I passed a few folks napping in chairs and a couple folks sleeping in the open on an inflatable queen sized mattress. I was definitely too tired to drive home so I lowered the rear seats and reconfigured my gear to make room for a quick nap. I swear I just closed my eyes for a second and an hour passed. I was, not surprisingly, stiff and sore. I repositioned a little and slept another 30 minutes before getting up and feeling human again. Amusingly the race was still going at 6:30 am. I drove home, took a quick shower, and went to bed. My feet recovered in about three days. My left inner knee bugged me for about two weeks before it started to subside. Overall I was surprised how fast I was able to recover this year. There was minimal hobbling around and almost no latent muscle soreness. Hydration: I'm very pleased with my hydration. It was mostly water, with some Gatorade mid-day and some Mountain Dew over night. I drink when I felt thirsty. Food: Close, but I could do better. My "real food" snacks were good but got old. I need a wider variety and real-real food like pizza, burgers, and donuts. Feet: partial success here. I avoided the painful crushing sensation from last year but I picked up blisters this year in a new spot. I think I'll change into a wider shoe like the Altra's earlier next year now that I know they work for me. Mentality: Last year I had pacers which helped keep me alert(ish). This year I went solo: no pacers and no crew (other than my visitors). I struggled mentally in the wee hours of the morning. I was just tired and it affected my pace, my ability to remember things, and my decisions. In retrospect wearing the ipod at night might have helped. At the time my thought process went something like "but you have some slow, sleeping music on the ipod! If you bring it, you might hear it and fall asleep." Apparently my brain could not come up with the concept of "skip song" at the time. I can see where having pacers and a crew are a huge help. Gear: I think I was spot on. I had no chafing anywhere (other than the blister thing). I had sufficient clothes to layer for the evening. My headlamps worked great. I wore two: one on my head and one around my waist. I used hiking poles after it got dark but didn't feel they were giving me as much extra boost as last year when I entered my 2am fatigue state. Pace: I started a bit too fast but was able to maintain a steady clip through 50K without undue stress. When I got slow, I got real slow. It's unclear if that's due to the early speed or if I'd have had the same results due to the blister/knee thing. I've sent queries to various parallel universes where I made different decisions but have not heard back yet. The Hampton 24 Hour Run is a great venue. The race is low key and has a nice casual feel. While some food and water is offered it's limited and you need to bring your own supplies. The volunteers were fantastic and always on top of things when counting laps. The race director, George Nelson, can be seen running laps himself from time to time, chatting with folks. He even remembered my late addition to the race and asked how I was doing compared to last year. The plaques for 50, 75, 100, and this year, 125 miles are a nice driver (note the mileage peaks in the race results). I particularly liked the earthy orange shirts this year too.